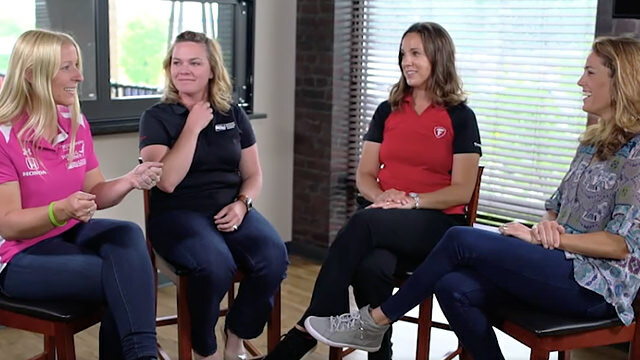 Ahead of the event, ESPN caught up with Pippa, team owner Sarah Fisher and the chief engineer for Bridgestone, Cara Adams, to chat about the importance of inspiring more women to get into racing. You can watch the video in full on ESPN, but a few of the discussions are worth highlighting. The most inspirational of stories comes from the only female chief engineer at the race, Cara Adams. Cara is responsible for the design and development of the Firestones used by the drivers and she shared a brilliant interaction she had with a young fan in April. I had a girl come up to me in Long Beach, a twelve year old girl come up and say "I really want to meet you, can you sign my hat?" and I said "Oh, I'm not a driver" and she said "I know. You're an engineer, I want to be an engineer for a race team when I grow up." The importance of having role models in highly visible positions cannot be understated - it is of course impossible to look up to something you cannot see. Expanding on this point further, Pippa discusses how her early inspiration came from an article in a motorsport magazine. "I was seventeen years old, I was living in Italy to race go karts semi-professionally and my dad sent me Autosport magazine from the UK. They'd done a feature on Sarah, because Sarah had just won pole and come second in Kentucky. And I was like "Oh my gosh", I couldn't believe it. And Sarah was the reason I started following IndyCar. It made such a big difference to me to know that there was someone else out there doing this. Never underestimate the power or importance of representation. Mann's 17th place on Sunday wasn't only a great finishing position, its relevance and impact for female fans of all ages to see someone on track with whom they can identify is immeasurable. Sarah Fisher sums up the situation nicely, "You've got to have someone to follow." Talking of which, you can follow and support all three participants on social media @pippamann, @cara_adams, @sarahfisher, plus ESPN's host @juliefoudy. Previous post She'll be back!